The programs contains the pre-defined basic templates for creation of geological documentation for all field tests (borehole, CPT, SPT...). 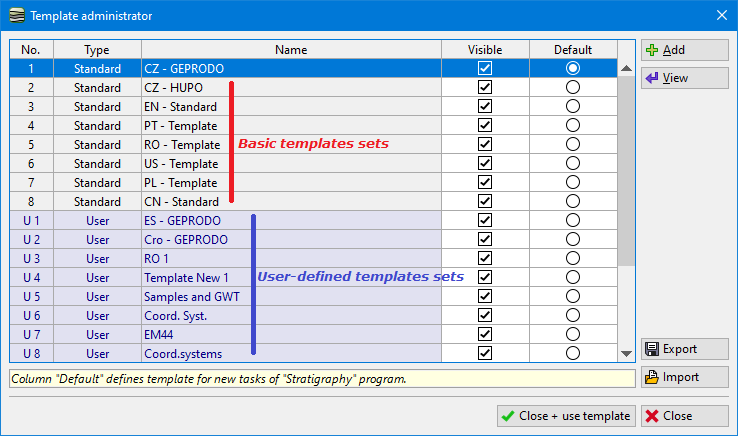 Because of big amount of requirements for geological protocols (logs), it is also possible to create User-defined templates. The best way to create own template is to start with predefined template and modify it according to the specific requirements. Using "Add into the administrator" button we define own template in the "Templates" frame. Part A - the name of new template is defined here (e.g. according to the country, name of company, standard...). Part B - it is switched between field tests by tabs here. A separate tab is used for a description of borehole layers. Each template defines all field tests. Part C - input data for selected tab (field test) are defined here. Part D - the form of output protocols is defined here for each type of field test. The editing is done in spreadsheet and it is similar to work e.g. in MS Excel. Dialog window "Add tests template"
Templates are compatible with each other and preserve the specified data as much as possible. The content of any fields that are taken from the basic templates will remain unchanged when the individual templates are switched. The creation of User-defined Template is described in detail in the engineering manual No. 40 - Creation of User-defined Template.